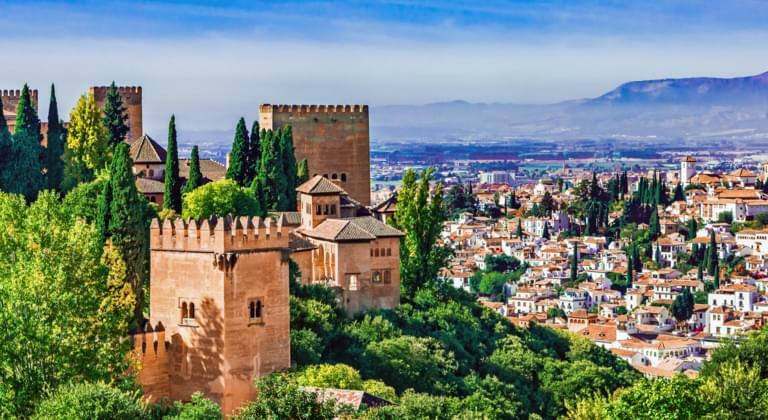 In the south of Spain the city of Granada attracts holidaymakers from all over the world who want to explore Spain by rental car. Located at the confluence of the Genil and Darro rivers, the university town has more than 2000 years of history and therefore has numerous historical monuments. A large part of the 230,000 inhabitants works in the tourism industry. Coming from Germany you can reach Granada directly with renowned airlines, the international airport Federico García Lorca is located 15 km west of the city. Am Granada Airport (IATA Code GRX) every established car rental company has an office and pick up point. The rental car handover is completed within a short time, provided you have used our comparison portal to make a reservation. With us you can rent every car cheaply and perfectly equipped, desired accessories and comfortable services. The rental car is waiting for you as booked and thanks to an optimally developed expressway you are in the centre of Granada in a few minutes. What you can explore there with the rental car, you will learn in the following. The red city castle is enthroned on a hill above Granada and testifies to the long lasting Moorish occupation. The fortress served as a residence for various Muslim rulers and is now a landmark and tourist magnet. After the Arabs were expelled from the Iberian Peninsula, a monastery was built in the Alhambra. During your visit you could also visit the Alhambra Museum. When you arrive by rental car, simply follow the signs for the building complex, which is a UNESCO World Heritage Site. Even in the city centre it is unmistakable that Spain was dominated by Islam for a long time. Nevertheless, the city is dominated by monuments with a Catholic background. The highlight of a walk is the Cathedral of Granada, which proudly rises above all the witnesses of the Moorish presence. Also worth seeing is the university built by the Jesuits near the monastery of St. Jerome. North of the centre is a university campus with an observatory, and the impressive monastery La Cartuja awaits your visit. All places of interest are heavily frequented during the season, but parking spaces for your rental car are available everywhere. On wide, well-maintained roads you can reach any destination quickly. Only eight kilometres outside of Granada you can walk and relax in fascinating nature away from the tourist streams. Take a rental car to the south-eastern village of Monachil and walk about two kilometres to the impressive Los Cahorros Gorge. The best times for this excursion are spring and autumn, because breathtaking natural spectacles are offered at pleasant temperatures. On our independent portal you can transparently compare the vehicles of any car rental company at Granada Airport and downtown and thus rent a cheap rental car that meets all requirements. You book not only very cheap, but also with all relevant services and accessories according to your needs. The reservation made with us considerably simplifies the pickup at the car rental. All you have to do is sign the rental contract and shortly afterwards you will be sitting in your booked rental car on the way to Granada. Below we explain to you what you should consider when renting on our portal and when renting a car during the handover. Which insurance to choose for a Car Rental in Granada? You should insure every rental car in your own interest. You can choose between policies with or without a deductible. Retention contracts are slightly cheaper, but they result in undesirable additional costs in the event of an accident. Insurance without excess contribute to calculable costs with optimal security and protect against unpleasant surprises. The insurance chosen for the rental car is a personalized variant that provides you as the contractual partner and driver with individual protection. However, if a travel companion becomes active as a second driver, you must ensure adequate insurance cover. Upon request, the car rental company enters an additional driver in the rental contract and thus extends the protection to this driver. On your card, the car rental company will block the deposit due on each rental car before pickup. The amount is available again after the vehicle has been returned without damage. On our portal you can see the respective deposit amount and which alternative payment options each car rental company offers. If Granada Airport is to serve as the starting point of a tour of Spain, choose the one-way option when renting on our portal. This allows you to cross the Iberian Peninsula and see more. When booking simply enter the desired departure airport. such as Murcia and return the vehicle at the same car rental company.